The Netonix WISP switch is the managed PoE Gigabit Switches with several Gigabit Ethernet RJ45 and SFP ports. Compared with Ubiquiti Networks Edgeswitch switches (40C), Netonix WISP switches was designed with a rugged chassis and extended operating temperature (-25 to 55C), which is more suitable for outdoor deployment. Furthermore, the ability to power AirFibers is the unique feature of WISP switches. This article will describe WISP switches in detail and help you choose the compatible Gigabit SFP optical transceivers for Netonix WISP switches. WISP switches are the Netonix Gigabit switches with the performance of Non-Blocking Throughput Switching and software configuration passive PoE. The Netonix WISP switches feature the ability to power many popular 24V, 48V/50V passive PoE devices from manufacturers including Ubiquiti Networks airMAX™, UniFi™, SAF™, MIMOSA™, Ligowav™, and airFIBER™ product lines. There are WS-24-400A, WS-24-400B, WS-12-250A, WS-12-250B, WS-12-250-DC, WS-12-250-AC, WS-12-DC, WS-10-250-AC, WS-8-250-DC, WS-8-250-AC, WS-8-150-DC, WS-8-150-AC, and WS-6-MINI. Note that: the No. “6”, “8”, “10”… in those model refers to the numbers of port. And “150” and “250” means the max power consumption. 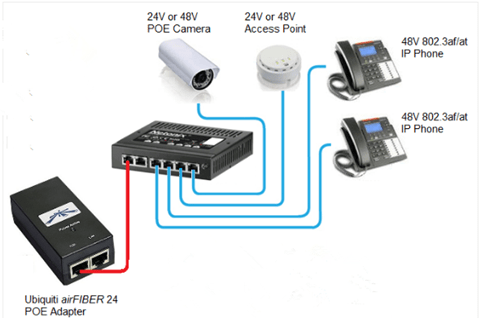 The above image shows the simple home network setup using WS-6-MINI switches. According to Netonix community, the SFP (optical module form factor) Gigabit Ethernet ports on WISP switches accommodate a full range of SFP optical transceiver modules, including SFP 1000BASE-T, SFP 1000BASE-SX, SFP 1000Base-LX/LH, SFP 1000BASE-ZX, SFP 1000BASE-BX-D, SFP 1000BASE-BX-U, SFP 1000BASE-EX. The following SFP optical transceivers are reported to be working fine on WISP switches. Fiberstore compatible optical transceivers are reported to work well on Netonix WISP switches. 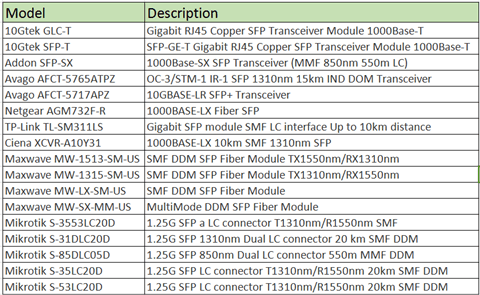 The following table lists the detailed information about the compatible optical transceiver modules on WISP switches. The Netonix WISP switches were designed to be part of the Small Business or home networking products that work together as part of proven, fully integrated, easy-to-use small business solution. These switches support a huge number of Gigabit Ethernet SFP optical transceivers. All these high-quality fiber optic transceivers can be found on FS.COM for competitive prices. FS.COM is committed to provide free shipping in USA, Mexico and Australia. ← How to Choose Fiber Optic Cable for 10G SFP+ Optical Transceiver?